Lucerne, Switzerland is a charming little city surrounded by mountains. I first visited it with my parents when I was 10 years old, and it is a place that made a big impression on me, even at such an early age. I loved the bridge, the mountains, the swans, and the sad lion! So for my first ever solo trip, I decided to spend a weekend in Lucerne. You can fly to Zurich Airport and from there take a train to Lucerne. The ride is short – about 50 minutes. I stayed just a few minutes’ walk from Chapel Bridge, so that was my first stop the morning after I arrived. It was a sunny, beautiful day with much warmer weather than I had been expecting for January! On the banks of the Reuss river, the markets were bustling with customers. Many swans were gliding along the river, and when another tourist tossed some food at them, they flew over to eat it. I didn’t have any food for them but I stood there for a long time admiring the view and the swans. 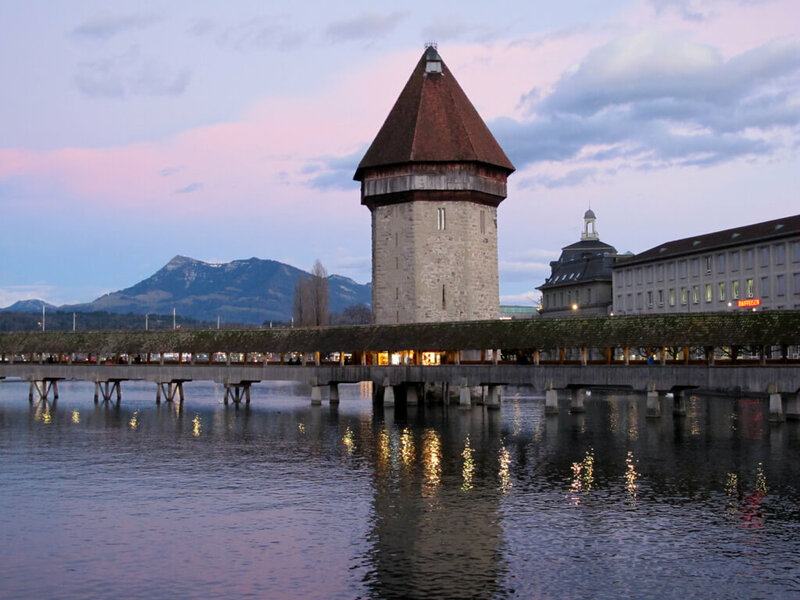 Constructed in 1333, Chapel Bridge is Lucerne’s most prominent landmark. It is the world’s oldest covered wooden bridge. However, most of it was destroyed by a fire in 1993 and had to be reconstructed. Some 17th century paintings depicting Lucerne’s history also had to be restored. The Water Tower (Wasserturm) attached to the bridge used to be a prison and torture chamber! Now, it houses a souvenir shop. Across the river is the lovely baroque Jesuit Church. Spreuer Bridge is Lucerne’s second covered bridge, and is about a 10-minute walk from Chapel Bridge. It is most famous for its 17th century “Dance of Death” paintings, which depict people’s feelings in the face of death. After exploring the area close to the river, I went to see the Lion Monument. The Lion Monument commemorates the Swiss Guards who died serving King Louis XVI of France during the French Revolution. The monument portrays a dying lion who has been stabbed with a spear. Next, I took a stroll on the trail by Lake Lucerne. There were lovely lakeside gardens where I saw people relaxing and having picnics. You can also take a boat ride on the lake. By the lake next to the trail is Verkehrhaus, the Swiss Transport Museum. Trains, cars and planes are on display there. There is also an IMAX theatre and planetarium. As well, there is a ride called the Swiss Chocolate Adventure which guides you through the history of Swiss chocolate. You can even try some free chocolate at the end. All kinds of flavours of Lindt chocolate are available in the gift shop. Overall, Verkehrhaus is an interesting place to spend a few hours, and the walk there from the Chapel Bridge area is very pleasant. If you’re not interested in the museum, visit the Musegg Wall, which was built in the 14th century to protect Lucerne. From the wall, you can enjoy a view of the city. For another magnificent view of the city, take the Gütschbahn funicular to the Château Gütsch Hotel. Near sunset, I returned to the Chapel Bridge area. If you enjoyed this guide, PIN IT! Lucerne looks like such a lovely place to explore! I’ve only ever heard great things about it, but I had no idea there was so much to do and see! Switzerland looks absolutely beautiful!!! Definitely will be keeping this city in mind. Awesome guide! Lucerne looks so beautiful. I have heard wonderful things from a friend. Your pictures are beautiful. Lucerne is a great little city for a weekend getaway! I loved wandering the streets of Lucerne. However, it being Switzerland, nothing is open on Sundays except a few restaurants. The architecture is really pretty there though a that bridge is so beautiful it needs to be seen in person! Ah its incredible how many beautiful spots are in France. I would love to visit Lucerne one day. Hopefully next time I make it back to Europe, since I am doing Eastern Europe this summer and have my travels all booked up!